Everybody's setup is different....this will help give a picture of what I actually use on an ongoing basis. Some people use items that I don't have (e.g. Rotator)....we each settle for whatever works for us, at the right price. One could do without any of these items and normally, they only get added, one by one, over time. Some photos.....click on thumbnail for larger image. 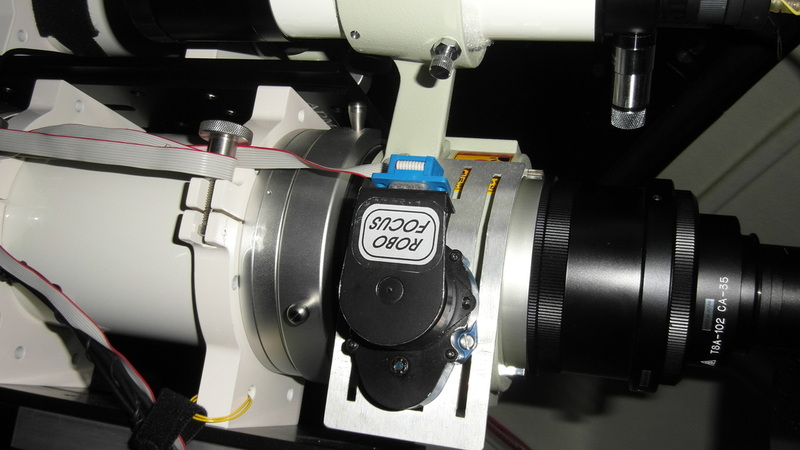 Dew strips on the scopes. FlipFlat on the 106 scope. Above you will note I put a double dew strip on the FSQ 106 scope and one on the FS 60 scope. 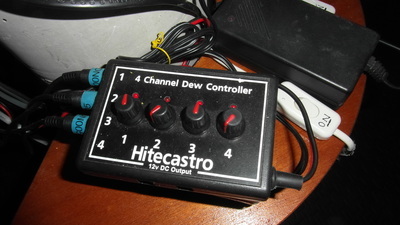 These are controlled by the Hitecastro 4 channel controller. Living by the sea, humidity is a big problem - some nights I can actually see it rolling in off the water. Even inside the observatory, I feel I need to protect the scope optics with the heaters, so in very humid conditions I leave the heaters on throughout (maybe not full on) even though I am not imaging. 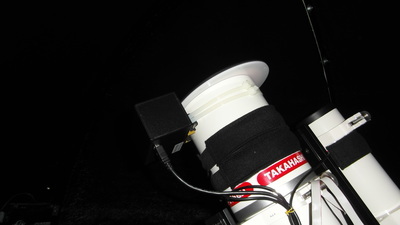 As noted in photo 3, I use a FlipFlat - which is great by the way - but the top of the scope is not totally sealed like with the normal Tak scope cover. The Flip-Flat is not a common piece of kit but it worked out great for me when I actually started taking Flats - which was not always the case. The Flats panel is actually on a hinged controller and is fully controlled by my capture program SGP. Once I did an initial set up (manually choosing a light intensity for the panel), SGP can 'work out' how much time exposure is required to create a Flat frame of specified ADU for each filter being used. Once that is set up (a one time operation), flats become just a tick of a box for any imaging session. 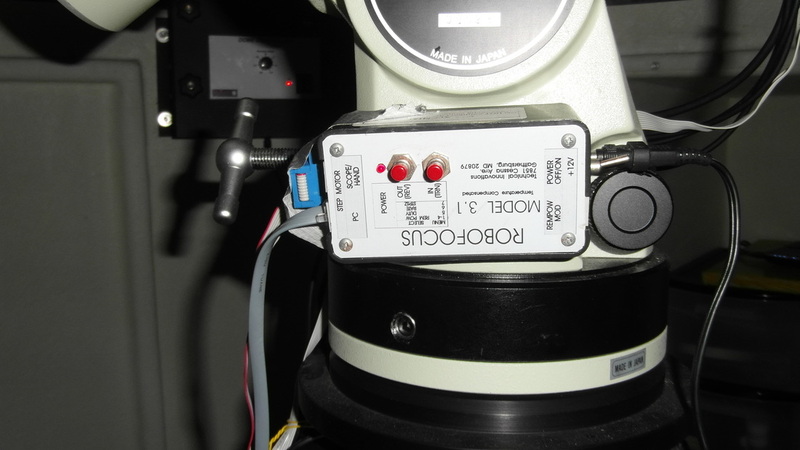 I use a Robofocus focuser, which has its own controller mounted at the mount base. It is useful in this position for visual observations. Normally, though, I do not touch it as I use the auto-focus feature in Sequence Generator Pro. Personally I have the programme set to refocus after each 20 minute sub. The final image above shows my storage area within the observatory - plastic 'drawer' type bins containing adapters, extensions, filters, cables, Bathinov mask, Tak 1.6 extender, Tak 0.73 Reducer, oculars.....as well as some small tools (Allen keys). They also provide a nice base for the laptop computer that controls everything. 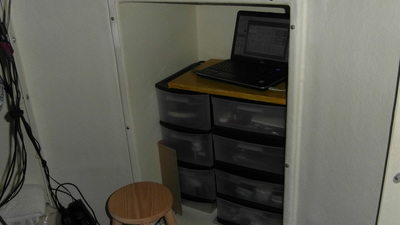 Although I have placed a stool in the Obs, I don't have to use it all that much. The house WiFi extends this far and I am able to control the laptop from another computer within the house (via TeamViewer) . Once I have everything up & running I retreat to the house and when all is well, I can leave SGP continue all the imaging tasks throughout the night. 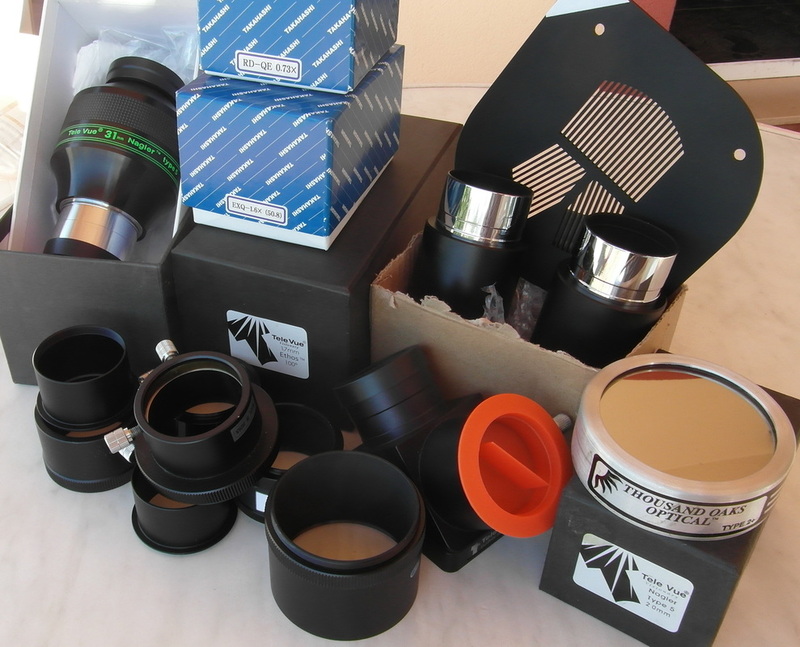 A view of some of the other bits & pieces - including the Solar Filter that fits the FS 60 CB. I have yet to catch the ISS crossing in front if the Sun - but it is on my 'to do' list. The oculars were bought originally for the Meade LX 200R, but I do pull them out from time to time (especially if we have visitors). 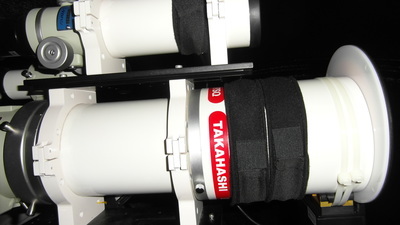 The extensions in the box with the Bathinov Mask are for use with the 1.6 extender. I have used the extender only once since I got it - it is very demanding on good seeing (brings my scope to f/8) which, so far this winter (2015/2016), has not been evident.